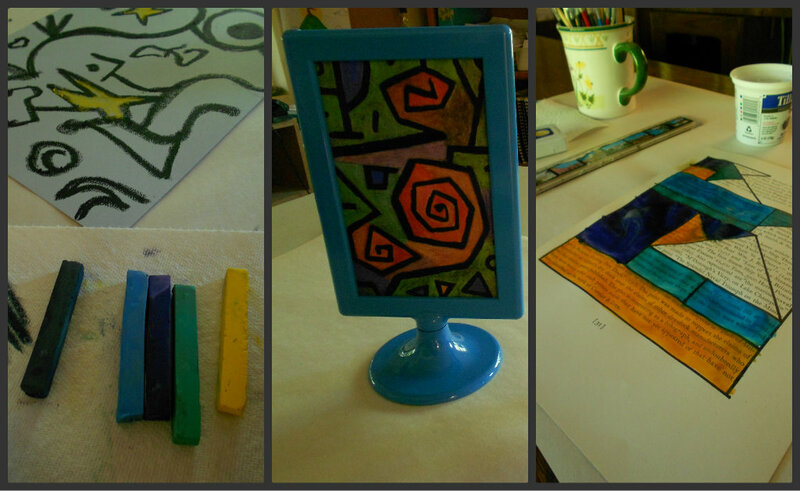 Our second Paul Klee Project was done with our homeschool art co-op. What a fun morning of art talk and art play we had together! 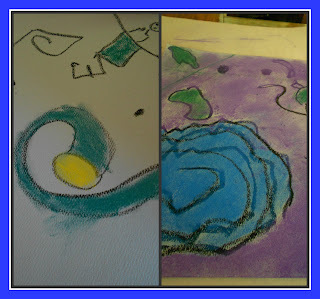 I was sort of worried about introducing chalk pastels but about half the group had used them before and the rest were very open to trying something new. We started off reviewing what abstract art is and how we can look at it with artist’s eyes. They had all seen the YouTube video before so we discussed how abstract art is not meant to actually look like anything but to make you feel something. This seemed a lot easier for them to understand than it does to me. I always try to figure out what things are in a modern art piece which really does take away from the enjoyment of it all. We then viewed a slideshow of Paul Klee’s artwork on YouTube, pausing the slideshow to do a little picture study as we went through the colorful abstracts. This was very enjoyable and the kids took turns doing the narrating. Then it was time to get down to some serious art business….I had prepared some of Klee’s prints in my fancy smancy IKEA frames for them to use as inspiration as they worked. This same group of children all had attended an event at the local observatory a few days before our art lesson so we decided that the night sky would be our overall theme for this project. 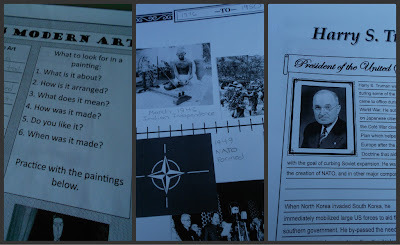 Because I didn’t want my beginners to be overwhelmed, we did this as a somewhat open-ended but guided art project. We talked a few minutes about things we had seen in the sky, how the night made us feel, and how we could draw from our experiences and reflect that in our artwork. We reminded ourselves that Paul Klee used lots of symbols in his artwork and thought of how we could incorporate that into our ideas. Moon, star, meteor, or constellation. Then they picked a color palette from the chalk pastels (4-6 colors). 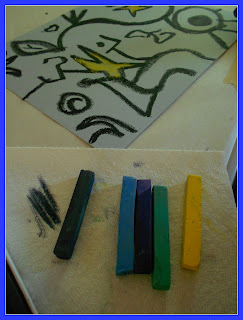 They filled in their designs with blocks of color using the chalk pastels. We played with blending, using our fingers and palms. After they finished with the color, they went back over their black lines again to define the shapes. I think our lesson was very successful. 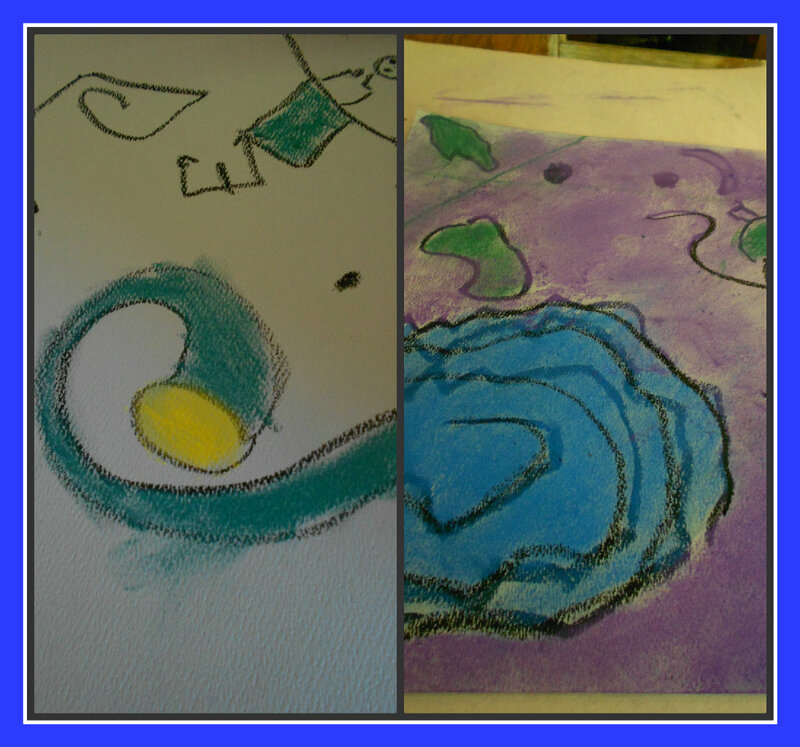 Not only did we create a wonderful piece of abstract artwork, we learned how to better use chalk pastels and create a mood using a color palette. Oh, how I have enjoyed teaching art to our little co-op! I didn’t even realize how much I missed it and Monday when we were in the midst of our Paul Klee study…I suddenly felt so happy I got tears as I soaked it all in. Crazy, crazy art mama. 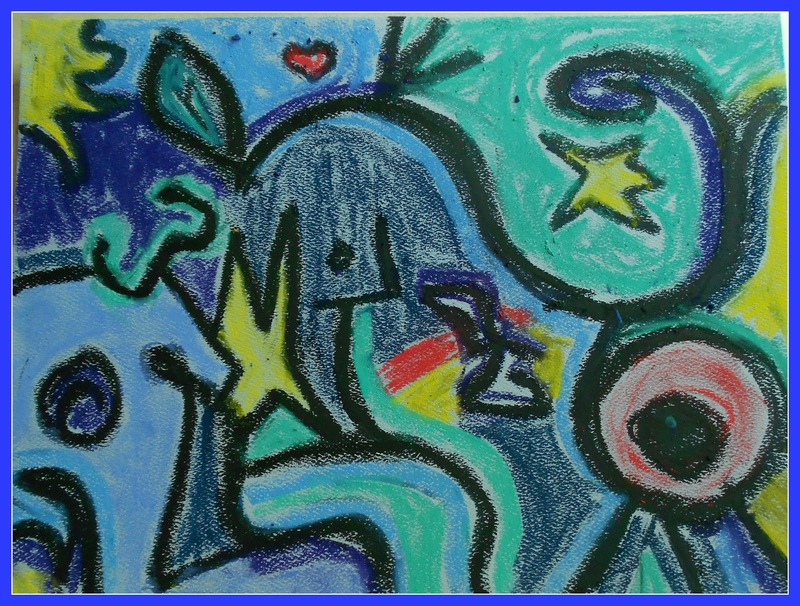 As a group, we viewed a lot of Klee’s artwork both online and with prints. I found the picture frames shown above during last month’s IKEA visit (TOLSBY). Aren’t they great for displaying art prints for picture study? They are 4″ by 6″ and they were less than $1 each! I can easily slip in a print for each week’s picture study time. They don’t work if the artwork is landscape but I can work around that. Mr. B also did another Klee art project on his own that involved a page from an old book and watercolors (idea from Pinterest). 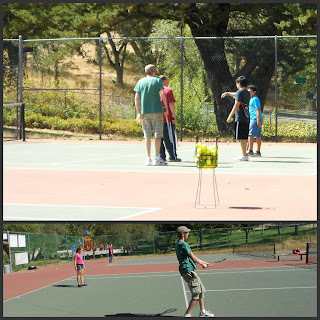 Our little homeschool group is also learning to play tennis. The advantage of homeschooling is that we can use the courts at the park during the school day and have the place to ourselves. One of the young men in our congregation has volunteered to give lessons twice a month and it is wonderful! 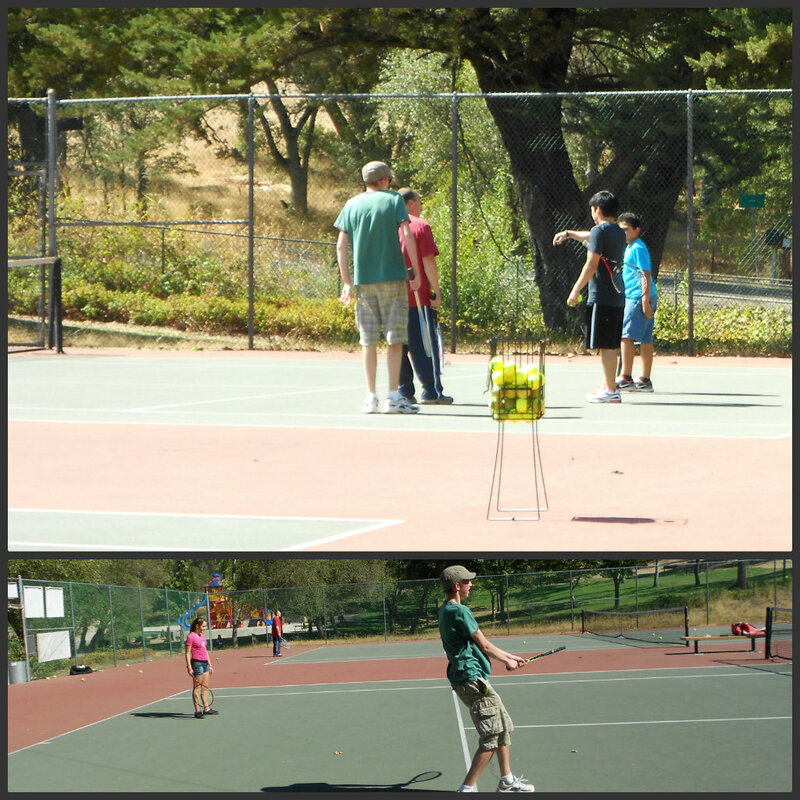 All the kids get lots of one on one time and even after two lessons they have greatly improved. None of the kids had even held a racket before so this is pretty exciting for them. Mr. B is really cranking out the school work these days as he sees the light at the end of his high school tunnel. We are still relying heavily on the notebook pages from NotebookingPages.com even in his senior year. He is continuing with his timeline of history, his study of 20th century history, and our focus on modern art. He is reading Steinbeck’s The Pearl and doing some writing to go along with it. Today we are off to have co-op nature study time….yes, I get to lead that too!